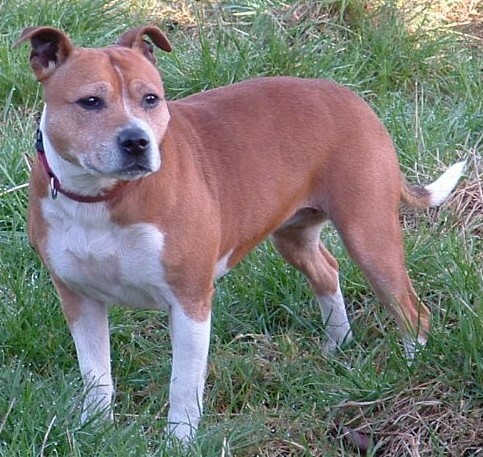 We never intended to by a pedigree dog but when a former colleague informed me that they knew an owner that had to get rid of a Staffordshire Bull Terrier puppy because their older dog had taken a dislike to it, the temptation was irresistible. So Bonnie, at three months old, came into our lives, our first family dog and one which my children, now grown up, can barely remember being with out. Bonnie, named after my Triumph Motorcycle, soon made her mark and our kitchen furniture still bear the scars of her puppyhood teething. Always full of energy, eager to make new friends and say hello like a coiled spring she would leap onto your lap, chair, bed determined to lick every inch of exposed flesh, especially ears, that she could. She didn’t confine her exuberance to family and friends either. Anyone was a fair target for her affection especially if they were sitting or lying down. One day, whilst walking through Roath Park, Cardiff, my wife (I bought Bonnie for her) let a friends child take the lead and they promptly let her off it. A rugby match was in full swing and a player went down possibley feigning injury. My wife shouted ‘Get up! Get up! Get up!’ but it wasn’t until Bonnies nose and tongue made contact with his ear did he leap to his feet, injury forgotten. Another time, a man relaxing, reading a newspaper was rudely interrupted when she leapt through the centre of it to give his face a good slobbering. Bonnie hated loud noises, especially fireworks. Her reaction to this would be to destroy the first thing she could find, this included record collections, various plastic boxes, a kettle, kids toys, a badger skull and a wine bag (half of which she ate and we had to dose her with liquid paraffin to ease its exit). On the eve of the millennium she bolted from our house in Cardiff as we stepped outside to view the fireworks. We thought we had lost her for good but fortunately she had entered a pub some miles away and a kind local phoned us, luckily she had a tag, and we were able to retrieve her. I never met anyone who disliked Bonnie, even self-professed dog dislikers would warm to her. 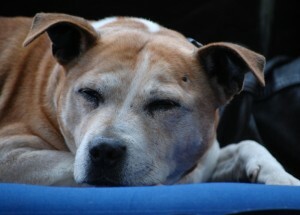 She was a brilliant, loyal friend to all the family and will be incredibly missed. Goodbye Bonnie. Select this photo to view a full gallery of photos of Bonnie. 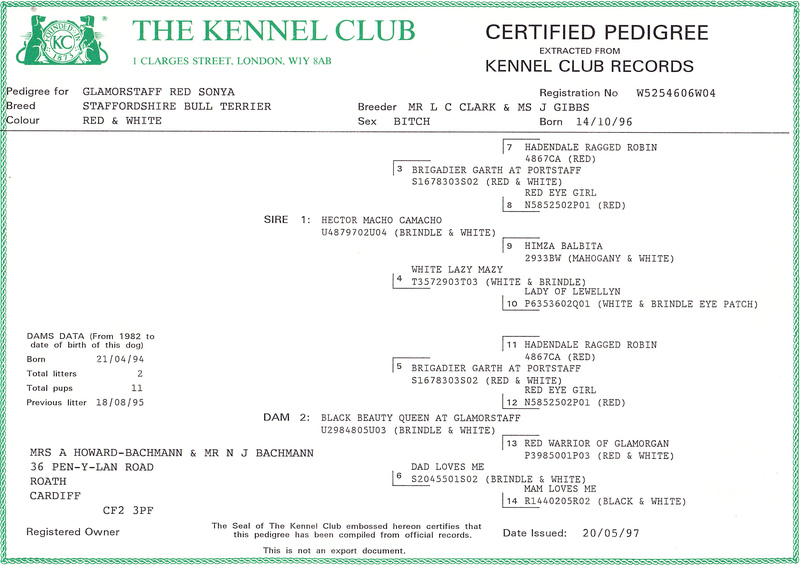 This entry was posted in Husband, Father, Dog Walker, The Rest and tagged Bonnie, dog, Dogs, Glamorstaff Red Sonya, Kennel Club, Red and White, Staff, Staffordshire Bull Terrier, Staffy by RedEyedMonster. Bookmark the permalink.